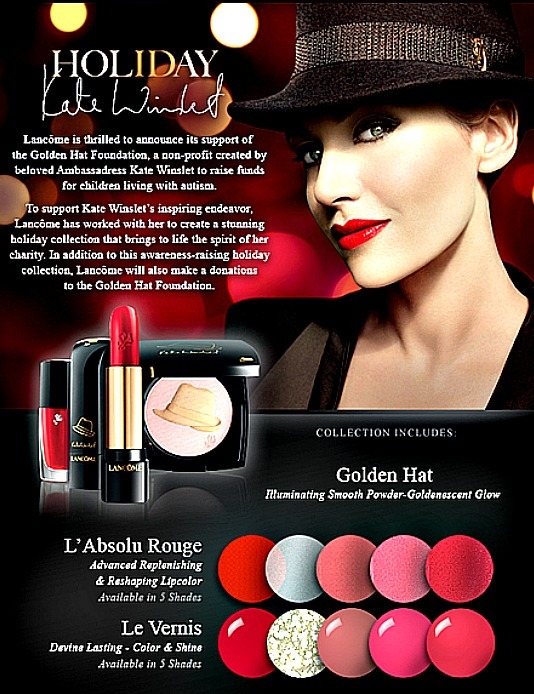 Here's a look at Lancome's Holiday Collection by Kate Winslet, that includes a glitter nail polish called Golden Sparkle. You can view the entire collection here. Lancome is thrilled to announce its support of the Golden Hat Foundation, a non-profit created by beloved Ambassadress Kate Winslet to raise funds for children living with Autism. To support Kate Winslet's inspiring endeavor, Lancome has worked with her to create a stunning holiday collection that brings to life the spirit of her charity. In addition to this awareness-raising holiday collection, Lancome will also make a donation to the Golden Hat Foundation. O.O If that last couple glitters Lancome did were any indication of how this gold one will be, it will be awesomesauce. I'm still pining for Le 54! It sold out before I could nab it. I'm definitely keeping my eye out for this one. It looks beautiful. I wanna see the golden sparkle!!! wowI would have never thought about lancome nail polishes before!